ScareLA provided an exciting weekend of Halloween fun for the entire family with magnificent virtual reality attractions, theme park announcements for Halloween and many vendors to start the Halloween shopping. The Los Angeles City Council officially proclaimed Aug. 4 as ScareLA, concreting LAs premier Halloween convention's connection with LA. 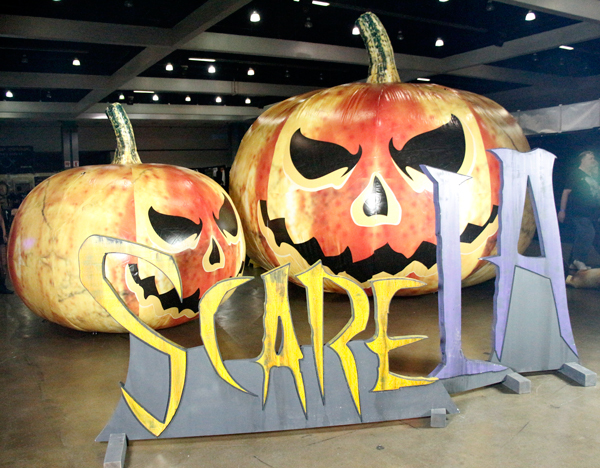 From the year one, ScareLA attracted Halloween enthusiast to The Reef/LA Mart in 2013 and steadily gained steam. Now in it's fifth year, ScareLA opened its doors at the Los Angeles Convention Center making this milestone year the largest space for the con. ScareLA Founder and Creator Lora Ivanova opened the convention on Aug. 5 by ripping through a caution tape ribbon with help from some eager zombies wanting to get things started. One of the biggest highlights of the convention, John Murdy, Creative director for Halloween Horror Nights at Universal Studios, Hollywood, talking about this years big mazes, which include "The Shining," American Horror Story: Roanoke" and "Ash Vs. Evil Dead," as well as announcing for the first time the "Titans of Terror" and "Titans of Terror Tram." The terror tram at Universal Studios Hollywood will include Freddy Kruger from "Nightmare on Elm Street," Jason Vorhees from "Friday the 13th," Michael Meyers from "Halloween" and be hosted by Chucky from "Child's Play." This year's SCARYWOOD housed some of the most incredible VR experiences, augmented reality and stage performances. Freakshow Deluxe at the Dark Stage at SCARYWOOD attracted a large crowd as there were sword swallowers and contortionists, as well as audience members stapling tips onto a performer. 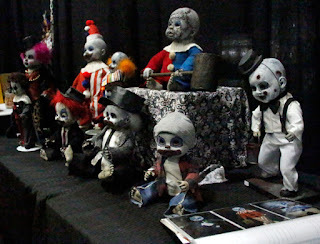 Dark art and customized Horror dolls from Gray Oddities attracted some attention with some creepy yet cute and amazing dolls. The dolls are all hand crafter, some creatively created from the imagination and some made inspired by classic horror creatures. Special custom request are accepted with flexible payment plans. The Dark Divas panel brought six talented horror industry females to the main stage. Actress and producer Jessica Cameron lead the panel which included writer Helen Shang, actress Naomi Grossman, actress Kristina Klebe, actress Emma Bell and actress Bel Deliá. They each talked about the path each has taken in their careers in the horror industry. Family-friendly, and creative, arts and crafts and educational classes were popular with activities such as making Wonder Woman gauntlets were fun and enjoyable for attendees of all ages. Some arts and crafts had an extra fee for material, but were worth the cost. Some of the talented people at the con meeting with fans, taking pictures and signing autographs included "The World of Aluna" co-creator Paula Garces, actor Juan Gabriel Pareja, actress Kate Tumnova, "The Walking Dead" Tell Tale video game voice actor Dave Fennoy and "Shameless" New Fiona actress Mary Kennedy. Rocking the Dark Stage, "Rocky Horror Dance-a-long" got people up and dancing in the spooky SCARYWOOD. ScareLA 2017 ended and left many looking forward for Halloween and a ScareLA 2018, fans can only hope until the next convention is confirmed.